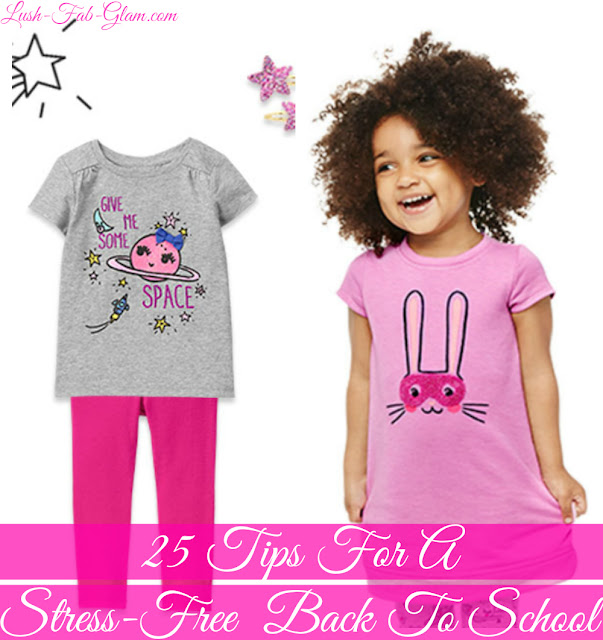 25 Tips For A Stress Free Back To School. *This Lush Fab Glam post is brought to you by our sponsor and affiliate Gymboree. It contains affiliate links and we will be compensated if you make a purchase after clicking the links. The summer season is flying by and while we are enjoying fun family adventures and watching the kids make the most of their summer break, the time to start preparing for back to school has arrived. A little head start and implementing a few smart tips will help to make back to school a stress-free experience for everyone! 1. Start by creating a list of what you need and setting a budget before doing any back-to-school shopping. 2. Do a clean up of your kids' closets and donate or hold a garage sale for the clothes that they have outgrown. 3. Shop for school supplies and clothes early. Avoid the rush and hectic in store experience by shopping online, where you can score great deals, discounts and savings during Back To School Sales. 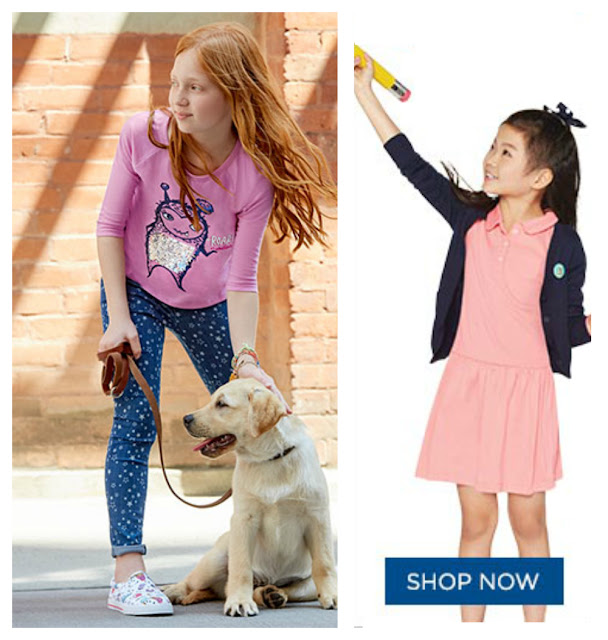 Right now for example you can save Up to 70% Off at Gymboree on the styles featured below and much more. Now that's what we call budget-friendly back to school shopping! 4. Once you are done with shopping for back-to-school fashion, teach your kids how to pick out and organize their outfits for each day of the school week on the weekend so that school mornings won't be so hectic. 5. Invest in lunch boxes and reusable bags, it's a budget friendly way to feed your kids and help save the environment. 6. Get your kids involved in creating and preparing their daily lunch menus. 7. If your kids will have their lunch served in school, ask for the school menu in advance and discuss choosing healthy and nutritious foods with your children. 8. During the summer break, plan educational activities for your kids like a visit to the zoo, science centers and museums where they can stay in learning mode while having a fun experience. 9. Keep your kids reading throughout the summer-break with trips to your local library or by downloading e-books. 10. Create and display a calendar that keeps track of everyone's schedules and extra-curricular activities. 11. Use sticky notes or highlighters to flag important events, dates and deadlines. 12. Make to do-lists and prioritize the tasks on it with your kids. 13. Designate a specific time and area for homework to be done. 14. Make sure that there are no unnecessary distractions like a television show or video games during homework time. 15. Re-introduce your kids to their school time sleep and wake up schedule about two weeks before the official first day of school. This will make getting back into their morning transition and routine much easier. 16. Review and reinforce rules about screen and device time, whether it's the TV, tablet or computer for the new school year. 17. Have an effective alarm that works, you don't want your kids and you snoozing or sleeping through the alarm on the first day of school. 18. It's always a great habit to set your clocks, wrist watches and even cell phones forward about 10 minutes. It will definitely help with punctuality. 19. If the family or kids share a bathroom create a schedule to avoid morning chaos and unnecessary fights. 20. If your kids take the school bus, make arrangements for backup transportation in case they miss the bus. Grandparents come in very handy for a quick drop off. 21. Stay in the loop and have an open discussion with your kids about the emotions they are experiencing about back to school whether it is excitement, anxiety etc. 22. Help to prepare your kids by talking about what they will experience on the first day of school, this is especially important if it's their first year or if they are changing schools. 23. For first year students and when starting a new school, it's always wise to visit and tour the school beforehand. Most school's offer an orientation and tour day to help parents and kids get acquainted with their new school environment. 24. Younger kids especially tend to lose touch with their school friends during the summer-break. If they are advancing to the same class, it's wonderful to plan a play date with a few of their closest classmates before back to school to help them easily reconnect. 25. Keep the first day of school fun by planning a family activity that you can do together after school ends. It's a great way to take away the stress and to give kids something to look forward to at the end of the school day.